BBL has reduced its iron ore production guidance after its Australian operations were affected by cyclone Veronica. A recent improvement in BBL's iron ore reserves improves the mining outlook. Strength in iron ore prices provides an opportunity for further price appreciation in the long-term. Investors should take some profit at these levels. 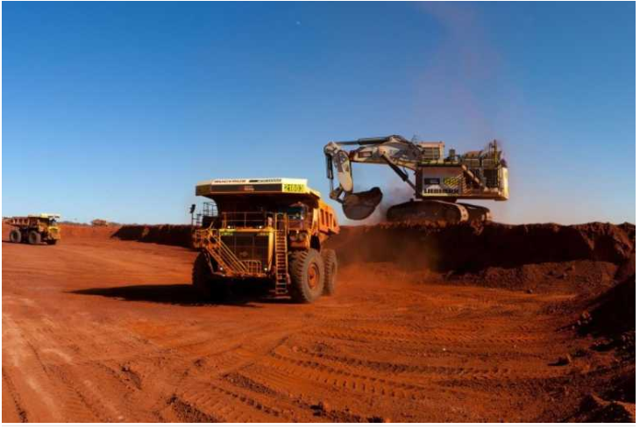 In this article, I have included a detailed discussion of BHP Group's (BBL) iron ore business. I have evaluated the impact of a recent cyclone in Western Australia, which caused the company to reduce its iron ore production guidance for FY 2019. Nevertheless, BBL has recorded an increase in its iron ore reserves and the outlook for its iron segment is brightened up by the recent rally in iron ore prices. Even though the solid mining outlook for BBL's iron ore business strengthens the case for future growth; I believe that the recent rally in BBL's share prices provides a 'take-profit' opportunity for the investors. Due to a recent cyclone in Western Australia, BBL expects its production of iron ore to decline between 6-8 Mt (read: a Million tons). The company is reviewing the annual production guidance to see if it needs revision from the initially expected levels of ~273-283 Mt. The problem emanated after BBL's port and rail operations (in the town of Port Hedland) were partially affected by the cyclone, creating problems in the deliveries of shipments. The impact of flooding is expected to continue till the end of April 2019, and thus affect the output of iron ore. However, the situation may aggravate further as another cyclone is expected to hit the Pilbara region in Western Australia. Despite the reduced production outlook, BBL's share price is sky-rocketing at the moment. At the time of writing the share last traded at ~$50.21, and that price was very close to the 52-week highs (Figure-2). On the surface, it might appear that BBL is currently pricey. But can it explore further upside from the current levels? During the quarter and half-year ended 31st December 2018, BBL's iron ore production stood at 58 Mt and 119 Mt, resulting in a 6% decrease and 2% increase respectively, for the said periods, on a Y/Y basis (Figure-3). The FY 2019 guidance for attributable iron ore production was set between 241-250 Mt. On a 100% basis, BBL's WAIO (read: Western Australia Iron Ore) business is expected to produce between 273-283 Mt of iron ore. However, due to the impact of cyclones (as mentioned earlier), this guidance will be lowered between the range of ~266-276 Mt. We can see that the production guidance has been reduced by ~3%, but the impact of reduced production outlook has been dwarfed by a solid hike in iron ore prices. As shown in Figure-4, iron ore prices have witnessed gains of ~50% during the past 12 months. When we compare these price gains with the expected ~3% reduction in BBL's iron ore output; it's easy to see why the share prices did not take a hit after a revision to BBL's FY 2019 iron ore production guidance was made by BBL. In my view, the significant upside in iron ore prices would definitely improve the mining outlook for the company in terms of increased revenues and higher operating margins. Moreover, despite the slightly reduced outlook for FY 2019, BBL's revised production guidance for FY 2019 (Table-1) is higher than FY 2018, and this would combine with improvement in iron ore prices to fuel BBL's growth. Effectively, this would mean that the decline in production guidance should not be a problem for the company. On a different note, we can also see obvious improvement in the iron ore reserves of BBL's WAIO business (Table-2). The table shows that based on revised estimates, not only the reserve life has been enhanced from 14 years (in 2017) to 16 years (in 2018), but there's also a massive increase in tonnage of MM (read: Marra Mamba) ore, from 720 Mt in 2017 to 1,680 Mt in 2018. The ore grading also witnessed improvement for both MM and BKM types of ore.
[Note: BBL has 88% stake in the WAIO business and this table depicts the ore reserves on a 100% basis]. In a recent announcement, BBL claims to terminate the services of ~200 employees at its Perth office. The redundancy scheme is part of management's plan to axe ~700 jobs in BBL's Australian region. This would entail a slight increase in redundancy costs paid to the outgoing employees, but it would also help the company control salary expenses going forward. It's interesting to note that BBL had employed ~62,000 employees at the end of FY 2018 (Figure-5), and without arguing the moral/ethical implications of such restructuring, I intend to emphasize on the timing of such a decision which, I believe, is important. The decision was announced at the time when iron ore prices are at their peaks, and the FY 2019 production guidance also suggests an increase in production. Therefore, the company could easily bear the financial burden of such restructuring with potential improvement in operating margins accruing to the company, in the long-term. A closer look at the iron ore price chart in Figure-4 reveals that the metal prices have witnessed rounds of bullish runs followed by bears. The recent run was a bullish one. We cannot predict whether this run would extend to the levels of ~$95/ton. However, one thing is for sure. Iron ore prices have witnessed enough strength to provide a 'take-profit' opportunity for investors. Nevertheless, a recent drop in China's iron ore inventories may result in increased demand emanating from the country that should help continue the hike in iron ore prices. In the preceding discussion, we have seen that BBL has a promising outlook for its iron ore business that is principally derived by healthy upside in iron ore prices and a significant increase in the company's reserves. This positive outlook shrouds the impact of a reduction in FY 2019 production guidance in the wake of cyclone Veronica. Nevertheless, since the stock is trading near the 52-week highs, investors would do well to book some profits at these levels.